Last summer we bought three baby pigs when they were they were about eight weeks old. They were so cute and we had quite the adventure getting started with them. Once we got them all settled in, raising them to butcher weight was very easy. We kept them in a large wooded area with electric fence. They enjoyed rooting around, eating grubs, acorns, and any other goodies they could find. 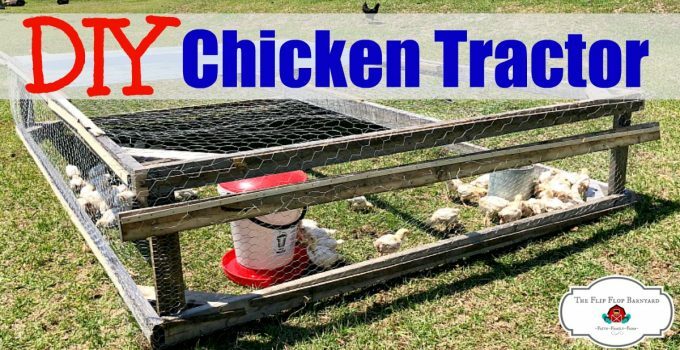 We provided them with plenty of table scraps, whey, and soaked non-gmo/soy-free grains. They were happy, grew well, and got nice and fat. 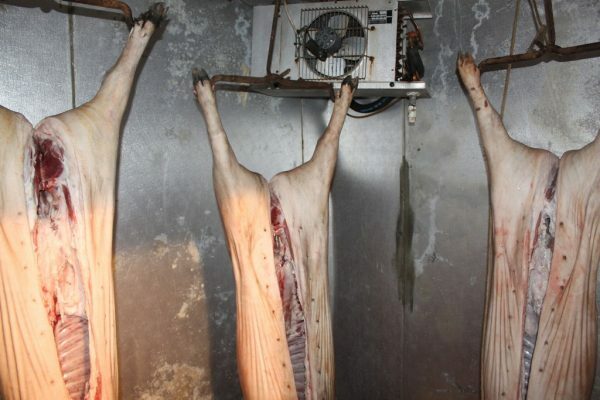 When the pigs were about eight months old in mid January it was time to butcher. We decided to butcher two of them for our family. As for the third pig, we decided to give half to my parents as their Christmas present. The other half went to some friends of ours. Since we are not experts at butchering we decided to send the third pig to a professional butcher to be processed for them. They will get their meat back in nice cuts all packaged up. We are so fortunate to have good friends in Tonya and David that work together with us for these types of projects. They also had two pigs ready to butcher with ours. We ended up doing four pigs all together. They have the right equipment for the job which is a must. It is so nice to be able to share the burden and help each other out. Having homesteading friends close by is truly a wonderful thing. Warning: The following process may not be for the faint of heart. 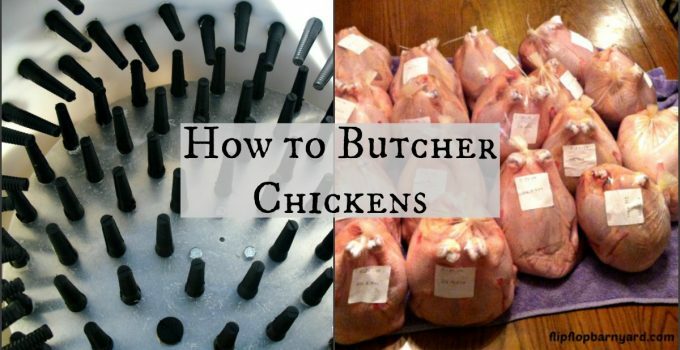 There are several steps to the process of animal butchery. Some steps are not as pleasant as others. We choose to butcher our own animals and involve our entire family in the process. 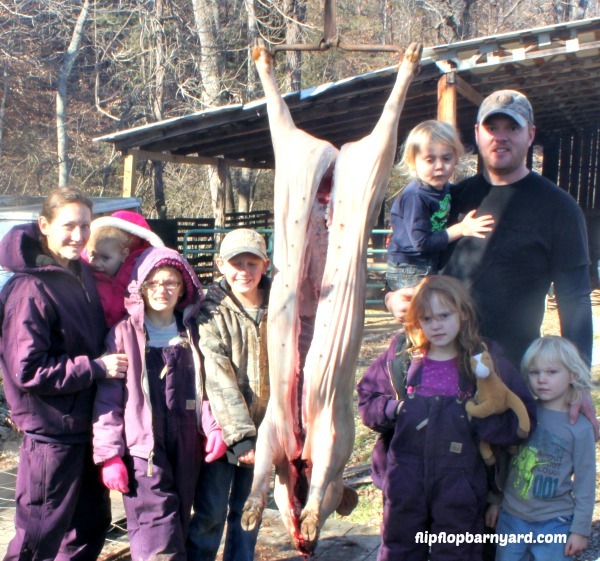 It is a wonderful thing for our children to learn, they also have a in depth understanding of where their food comes from and how it was raised. Step 1- Dispatching the pig. I left this part up to Farmer Derek. We used a .22 rifle to do the job. The idea is to shoot the pig directly in the brain, this is the most humane way to kill the animal. Once the shot is taken, the animal immediately drops to the ground. The next thing you do is called “sticking” the pig. This where you use a sticking knife to cut the main arteries to the heart ensuring that the pig bleeds out. 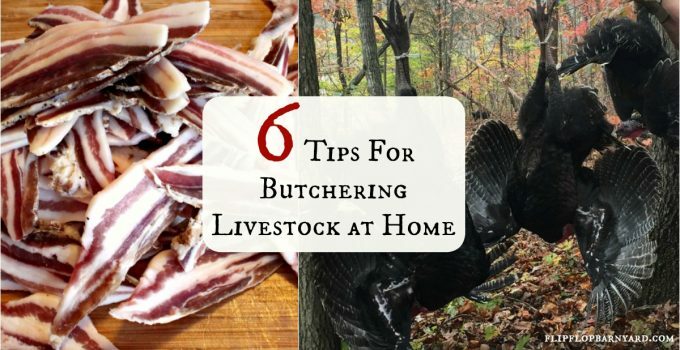 You will end up with cleaner meat without leaving excess blood in it. Step 2- Scalding and scraping. Now, the pig needs to have the hair and outer layer of skin removed. Some people choose to skin their pigs. We wanted to leave the skin on for curing parts of the pig. We used a large scalding tub with a fire under it to heat the water. We found that having the water temperature between 165°F-167°F was the perfect temperature to scald at. If the water is too cool the hair won’t release and if it is too hot you will actually begin to cook the pig. We kept the pig in the tub for several minutes to get the hair nice and loose. We used some antique hog scrapers to literally scrape the hair and outer layer of skin off. It was pretty cool! Step 3- Eviscerating (gutting). This is another step of the process that I prefer to let Farmer Derek handle. The gutting process must be handled very carefully as to not rupture any part of the innards inside of the pig. We hung the pig by its back legs from a gambrel held up with a tractor. To start, Farmer Derek cut around the backend (if you know what I mean) ensuring everything was loosened up. We used a piece of string to tie it off so that nothing leaked out during the process. Next, he very carefully sliced straight down the middle of the belly. There is quite a thick layer of fat here that you have to cut through to get inside. once he got the pig opened up he used a bone saw to split the sternum. He then ever so carefully worked all of the guts and organs out. We had a “gut pan” under the pig to catch it all. Step 4- Cleaning and final inspection. After all of this was done, we carefully washed the pig with water and checked it over to be sure nothing was missed. After this we hung the pig in a walk in cooler to allow it to chill for two days, making it easier to work up all of the meat. That is how to butcher a pig in a nutshell. The working up of the meat is whole other post in and of itself. I will be writing about that part as well. We also salt and sugar cured the bellies, jowls, hocks, and two hams. I will be sharing how that was done soon. This was our first time butchering pigs. We were very pleased with how it all worked out. We didn’t have any major kinks. 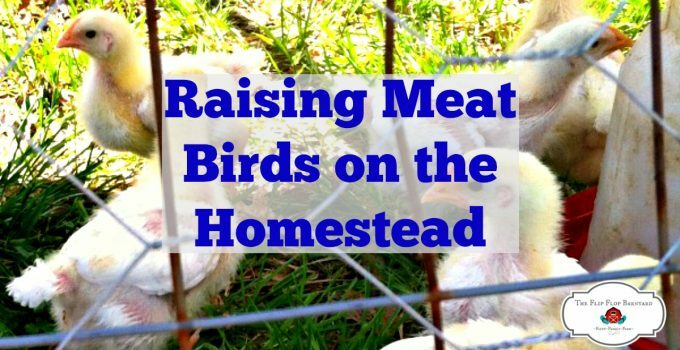 When doing anything on the homestead it is a learning process. We see what works well, what doesn’t, what we will change and what we will do the same. We have been enjoying the fruits of our labor. I have said many times before and I will say it again: There is such a satisfaction in sitting down to eat a meal that is a result of your hard labor. The kids see it and feel it, we see it and feel it. Words truly cannot express the feeling and passion that we have for raising our own food and teaching our children these things.